Lung cancer is common and lethal, and can occur in survivors of previous cancers. We sought to describe the incidence and mortality attributable to second primary lung cancers (SPLC) among survivors of other cancers, and to identify survivors at highest risk. We identified adults diagnosed with a localized malignancy from non-pulmonary cancer sites from surveillance, epidemiology, and end results (SEER) data from 1992 to 2008. We explored factors associated with the incidence and death from SPLC using bivariable and multivariable models. Finally, we compared standardized incidence rates for SPLC in our cohort with the control arm of the National Lung Screening Trial (NLST), a randomized lung cancer screening trial. We identified 1,450,837 survivors of non-pulmonary cancers, of whom 25,472 developed SPLC at a mean (SD) follow-up of 5.7 (3.6) years. Over half (57%) of patients with SPLC died of the disease. Survivors of cancer of the hypopharynx, oropharynx, tonsil, and larynx, experienced SPLC at standardized incidence rates which greatly exceeded that observed in the control arm of the NLST (572/100,000 person-years). Additionally, survivors of bladder and esophageal cancer had rates that approached the NLST control arm rate. 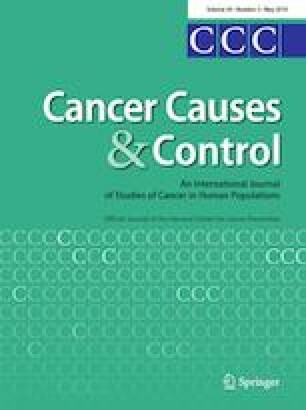 Increasing age and being divorced/widowed/separated were independent risk factors for SPLC in most primary cancer types. The incidence of SPLC in survivors of certain primary cancers greatly exceeds the rate observed in the control arm of the NLST. Further study could help determine if screening for lung cancer in these cancer survivors could prevent death from lung cancer. The online version of this article ( https://doi.org/10.1007/s10552-019-01161-7) contains supplementary material, which is available to authorized users. This work was supported in part by the STOP Cancer Foundation and the Flax Family Foundation (KC). All authors report no financial conflicts of interest. Dr. Nicholas M. Donin and Dr. Karim Chamie take ultimate responsibility for the integrity of the content contained herein.